Obtaining a sample from a comet is a complicated business - you need a spacecraft, a lander, which has to be manouvred to land on the surface, take a sample, then rendesvous with the parent craft to reurn the sample - this is the approach being taken by ESA's Rosetta mission, which includes the 'Philae' lander. Suppose you could do away with the lander, and take the samples while remaining in orbit? 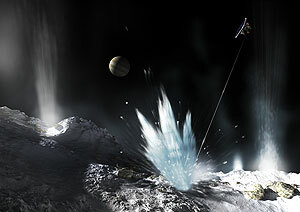 The is what scientists at NASA's Goddard Space Flight Centre have been working on - firing a harpoon into the surface of the comet to collect a sample. The team, lead by Dr. Josepth Nuth, have been test firing harpoons from a large crossbow into materials which approximate a comet. 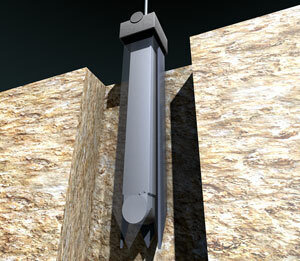 The harpoon would penetrate the surface to a depth of up to 1m, collecting a sample in an inner cassette which would then be winched back to the spacecraft. The craft would carry multiple harpoons to allow for samples to be taken from various sites. "The harpoon mission does not need to land, so it can sample from virtually any terrain" said Dr. Nuth. "A harpoon obtains a sample very quickly, in less than a minute, rather than over days or weeks for a drill on a lander"
Image appeared in Issue 5 of magazine "All About Space".